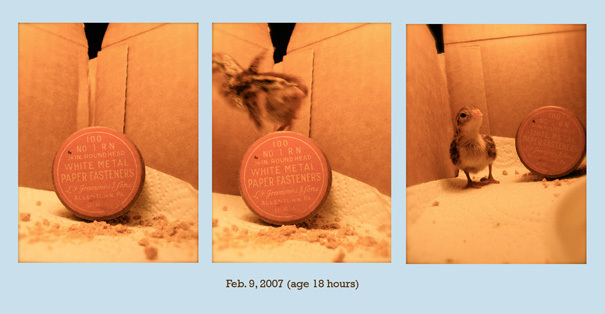 Peter Frank ordered some eggs and turned on the incubator a couple weeks ago, and this week we had a nice hatch of bobwhite quail at the photo studio. I took one little guy home for a couple of days to try out as a pet. Fuzzy and not much bigger than a wine cork, the little peep seemed to enjoy his lamp-warmed box on the kitchen table, and looked up at the sound of our voices. But at night he would call out in that quail way. He didn’t follow our hand around the box. Somehow he’d kept his wild bird-ness. So after two days we put him back in with the others.